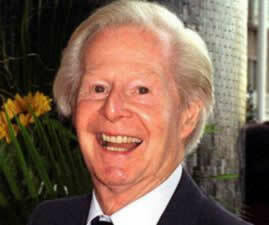 Tony Hart was born in October 1925 in Maidstone, Kent. 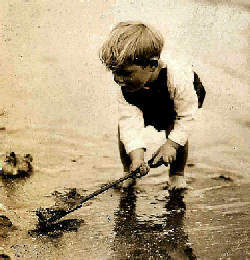 Here he is just over two years old, attempting what may have been his first ever beach mural! Tony's Prep School was All Saints Resident Choir School, Margaret Street, London W1. His public school was Clayesmore, where he was an active member of the cadet force. 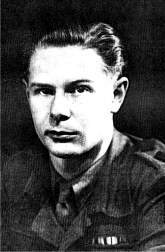 The war was still on when he left Clayesmore in 1944. Tony undertook formal art training at the Maidstone Art College, where he graduated in 1950. His first job was as a display artist with a well-known West End store. He saw no future in that, and became a freelance artist, sharing a horrid basement flat with his brother Michael (who went on to become a tv producer and director) often painting murals on restaurant walls in return for free meals. 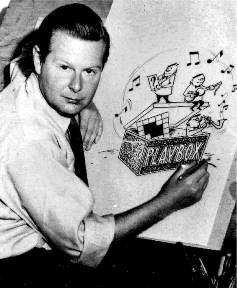 Tony Hart's luck changed when, in 1952, he met a tv producer at a party and was invited to come for an interview. After demonstrating his skill by drawing a fish on a BBC paper napkin - which had been provided with his coffee - he was engaged as the resident artist on the BBC/Children's tv programme Saturday Special.